"Coated with tangy Hidden Valley® Original Ranch® Dressing, chicken breasts are then dredged in a cheesy panko mixture and baked until crispy and tender." Pour the Hidden Valley(R) Original Ranch(R) Dressing into a large bowl. Add the chicken to the bowl of dressing and mix until the chicken is evenly coated. In a shallow bowl, add the breadcrumbs, Cheddar and Parmesan cheeses and stir until well combined. Dredge each breast in the bread crumb and cheese mixture. Arrange the chicken on a parchment-lined baking sheet. Bake the chicken for 20 to 25 minutes until the chicken is crisp and an internal temperature of 165 degrees F is reached. 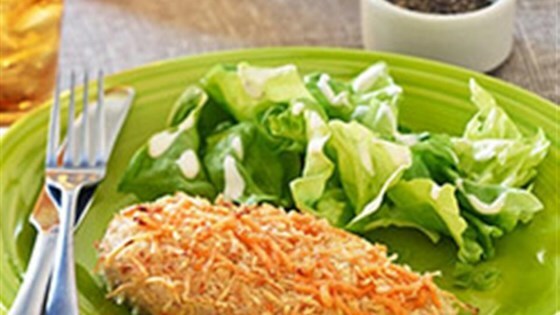 See how to make a simple, top-rated baked chicken recipe. Delicious chicken! I had too cook it for about 35-40 minutes, not 20-25, but other than that the recipe was simple to make and tasted excellent. This was so tasty and moist! I made it for my sons and they loved it. Did not have ranch so I substituted Creamy Caesar. Breasts were large and thick so an additional 10 minutes were needed. Flavor was super.